INADEQUATE: Two women were found living in this unofficial ‘care home’. 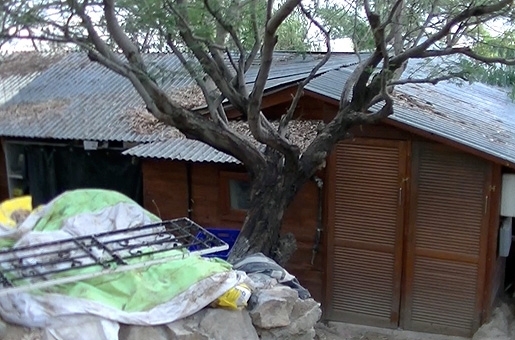 TOWN hall officials claim they found two elderly women living in wooden huts at an unofficial ‘care home.’ Mijas council has now reported the ‘care home’ for the elderly in the Valtocado area for being run with inadequate health and living conditions. They reported the situation to the courts and the Junta de Andalucia Department of Health and Social Welfare. The discovery came following a call from the Costa del Sol Hospital to the Social Services, reporting their suspicions that an expatriate woman was living in unhygienic conditions. Local Police, Social Services, firemen and members of the Urban Development and Health departments visited the location. They found two elderly Dutch women living in wooden huts on a plot where refuse of all kinds was stored. They believe the owners of the property were taking money for the women to allow them to live in the huts. One of the women has returned home after the Dutch Embassy in Spain was contacted. The other was taken to a care home in Torremolinos, but reportedly returned to the hut in Valtocado. A Junta de Andalucia Health and Social Welfare inspector attempted to visit the facilities following the report but found the property closed.